Per qualsiasi richiesta o informazione contattaci senza impegno tramite questo modulo! The Marmi Senco snc is a company founded in Rezzato, the more natural context of the extraction of Botticino marble. For three generations, the company is specialized in the production and processing of Botticino marble serving diversified sectors, from civil to urban. The passion and experience that have always characterized Marmi Senco, combined with the recent use of machinery and the latest technology, enabling the company to achieve more precise and refined work on all types of marble and get the coveted brand recognition of Botticino Classic Marble. For a few years, to meet the different needs of clients, Marmi Senco is specialized also in the processing of quartzite, granite and composite materials for the furniture. Through continuous investment in research and development, today Marmi Senco is able to satisfy any request through the processing of different materials having different characteristics. 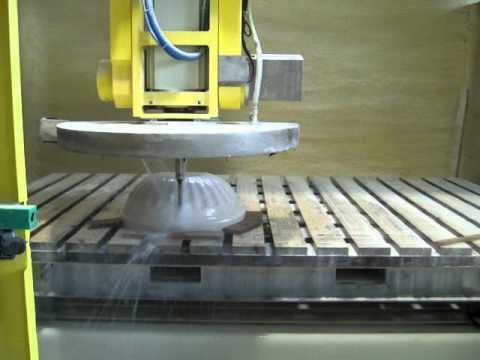 Process of creation and processing of a marble fountain. After being etched and designed the piece of marble is sanded and polished to give final shape to the piece of furniture. The Botticino marble is a special type of compact micritic limestone of beige color, quarried from Botticino, Nuvolento, Nuvolera, Rezzato and Serle in the province of Brescia.